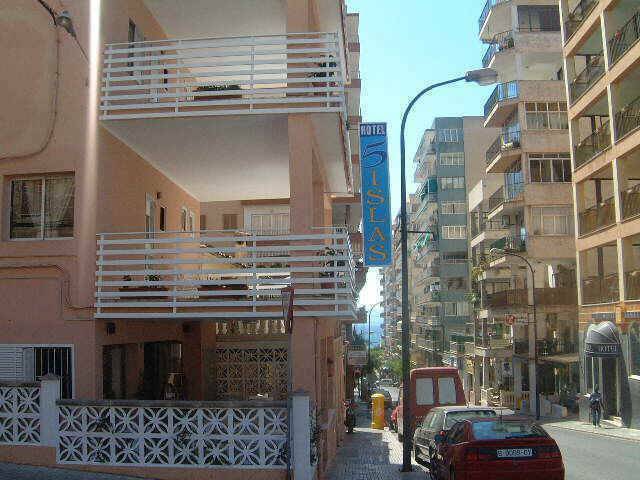 Hotel 5 Islas ** on the Palma Beach, family and friendly hotel for good price. Definitely YES ... Place was great! Staff was so friendly and helpful!!! I would recommend this place to everyone! We offer relax in any of our 32 rooms all with super quiet air conditioners, own and private bathrooms, TV, MINIBAR , terrace and daily maid service and all of it for a really cheap price. Ask for our special offers. We belongs the same company of H. SOL DE MALLORCA. Daily maid service, coffe bar with pic-nic service to take away, pets alloweds (if no noisy), fax service, internet acces at the looby, excursions and flight info service, late check-out ( with charge), wake up service and transfer service arrangements. From the airport take the highway towards Playa de Palma-Santany and take the exit 13 the roundabout make a right and follow the way down by St. Cristobal st. you will find the hotel at your left hand side just at #38 in front of the old Guardia Civil headquarter. Our property is located in the small town called SArenal, just a few meters from the relaxing beach located in the bay of Palma de Mallorca; just 15 min. From Palmas old center andm 15 min. From the International airport Son San Juan. The bus stop is at the corner.